Many people try to figure out a functional MTS to AVI video converter to transcode their shot MTS video files to AVI format for free replaying or editing. As is known to all, MTS is a filename extension used for the BDAV MPEG-2 Transport Stream container file format. It is commonly used for high definition video on Blu-ray Disc and AVCHD. Usually, .MTS or .m2ts is the filename extension of AVCHD format which is a high definition digital video camera recorder format. Obviously, AVCHD camcorder from Sony, Panasonic, Canon, and more is the main source of MTS video files. Though MTS video file is famous for its perfect quality, there are many compatibility problems. In other words, in order to successfully play MTS on various video players like ALLPlayer, MPlayer, VLC, PotPlayer, etc, users should install additional codec, component or plugin. And the most important thing is that QuickTime can't play MTS video files. This is also why so many people desire to decode MTS to AVI for compatible with all kinds of media players. Next, keep reading on to learn exactly how to convert MTS to AVI on Mac/Win. * flawlessly convert AVCHD/M2TS/MTS to AVI with world's No.1 fast speed and original quality reserved. * directly transcode MTS to 350+ mobile devices (iPhone X/8/8 Plus/7/7 Plus/SE/6s/6s Plus, iPad Air 2, iPad Mini 4, iPad Pro, iPod, Apple TV 4, iTunes, iMovies, Samsung Galaxy S8/S7 edge, HTC One M9, etc ) for streaming without limits. * edit video by trimming, cropping, merging, adding watermark/subtitles, etc. * convert any video to over 180 video formats and 14 popular audio formats on Mac/Win, for example, MTS to MP4, MKV to MP4, AVI to MP4, WMV to MOV, MKV to AVI, VOB to MP4, FLV to MP4, AVCHD to AVI, MP4 to MP3, etc. * free download online videos from YouTube, Yahoo, Dailymotion, Vimeo, Vevo, Metacafe, Myspace and more 300+ sites in 4K/8K UHD, 1080P/720P HD, MP4, 3GP, AVI, MTS, MOV, etc. Before converting AVCHD/M2TS/MTS to AVI, you ought to download this MTS to AVI video converter on your Mac computer (macOS High Sierra included); please download Windows version (Win 10 supported) if needed. Now, follow the below steps to convert MTS video format to AVI. Step 1: Fire up MTS video converter for Mac/Win on your computer and click "Add File" button to load MTS video file that you wanna convert. Batch conversion is supported. Step 2: Choose AVI as the output video format from the "Output Profile" pop window. Warm note: you can reduce output AVI video file size by cropping frame size to remove the black bars or adjusting other setting in this step. Step 3: Click "Browse" button to specify an output directory to save the converted AVI video and hit "RUN" button to start to convert MTS to AVI. Later, you can play the converted AVI files on your favorite video players like VLC, QuickTime, etc. 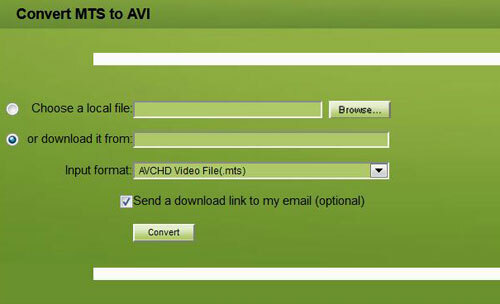 And these three straightforward steps are suitable to convert AVCHD to MP4, TS to AVI, MOD to MP4, MKV to AVI Mac, etc. Another simple way to convert MTS to AVI is relying on online free AVI file converter. There are a lot of proper MTS video converters on the market, such as convertio.co, onlineconverter.com, Zamzar, online-convert.com, convertfiles.com, etc. Here, we take convertfiles.com as an example to teach you how to convert MTS to AVI. Step 1: Click "Browse" to upload a local file that you desire to convert or download it from online sites. Step 2: Choose the input and output format. Step 3: Tap "Convert" button to convert MTS video file to AVI format. You can choose "Send a download link to my email" for getting the converted AVI file at any time. 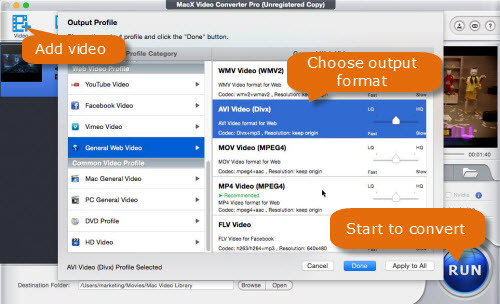 Free download the best MTS to AVI video converter - MacX Video Converter Pro to quickly and fast convert MTS to AVI and other files such as MP4, MOV, M4V, MTS, AVI, WMV, etc on Mac/Win with original quality reserved and world's No.1 fast speed.